Over the past several years, educators across the preK-20 spectrum have begun turning to nature to enhance creativity, innovation and problem solving among students. Research on natural classrooms indicates that educators who use them credit enhanced aesthetic values and the infinite diversity of natural materials as two key ingredients for supporting learning outcomes. One such promising effort is taking hold in Seattle through Tiny Trees Preschool. Curious to see for myself how this phenomenon is unfolding in Seattle, I traveled down to Tiny Trees Preschool at Camp Long located in the city’s diverse south end. Tiny Trees is an entirely outdoor, nature-based preschool whose mission is “to make a quality preschool education in reading, math and science affordable and to give children a joyful, nature rich childhood – one full of play, discovery, and exploration.” Tiny Trees works in partnership with City of Seattle and King County Parks to activate open spaces as nature preschools based on the Forest School model prevalent throughout Scandinavia. In academic year 2016-17, Tiny Trees launched six preschools at four City of Seattle Parks and enrolled over one hundred and forty three to five year old students. Three additional preschools launched in the 2017-18 academic year at Big Finn Hill Park, Cougar Mountain Park, and the Seattle Art Museum’s Olympic Sculpture Park. Finding Camp Long on a late spring morning, I immediately left the chaos of traffic, congestion, sirens behind and descended into its lush, emerald landscape of forests and fields. Through the thick blanket of firs, pines and cedars, I followed the laughter of children down a wooded trail deeper into the forest. Glints of brightly colored rain suits began to peak through the trees; a band of dozen or so preschoolers and their teacher, Katherine Miller, gradually came into the view. Many of the children were already draping from a fallen Maple tree whose broad branches fanned out across the trail making it a perfect set of uneven bars or balance beam however in an entirely natural gymnasium. Like her students, Katherine was decked head to toe in all weather gear. I could have mistaken her for a seasoned park naturalist or wilderness guide. Indeed, serving as a Tiny Trees Preschool Lead Teacher requires expertise in both which Katherine seemed to fully embrace. Originally from Kalamazoo, Michigan, Katherine got her start in secondary education health sciences having born witness to the disparities driven by our No Child Left Behind test driven academic approaches and the health impacts on children daily confined to rows of desks in windowless classrooms. She found her way to a local nature center outdoor preschool, became enamored with the model and joined the North American Association for Environmental Education’s Natural Start Alliance which supports the nature-based preschool movement taking hold across the United States. Over the past three years, Natural Start has grown from 40 independent preschools to over 300 as the benefits of environmental early childhood education become more widely known and demand among families and communities continues to grow. Among Natural Start’s membership, Tiny Trees is the only enterprise aspiring to do more than offer a one-off independent site. 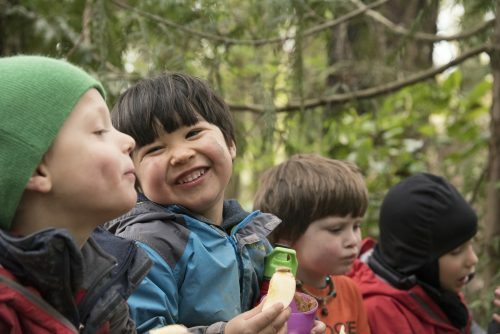 Rather, Tiny Trees’s founder Andrew Jay’s vision has been to marry the benefits of a quality preschool education with those derived from outdoor, environmental education through an economically affordable model by scaling Tiny Trees to communities across Washington State. Katherine happened to see the Tiny Trees job posting on the Natural Start website, flew out to Seattle for the interview, and signed on to be among Tiny Trees’s first cohort of pioneering teachers. In the summer of 2016, she packed up her life, left friends and family behind and headed for Seattle to open one of six Tiny Trees pilot preschools at Camp Long as its Lead Teacher. Anyone who has ever moved to Seattle knows firsthand that the reality of the day in, day out overcast and rain is not fully grasped until you winter through it. This is ever more true for a young teacher charged with shepherding fourteen three to five year olds (and their families) through an entirely outdoor preschool academic year experience. Yes, Tiny Trees is an entirely outdoor preschool with no warm, cozy shelter, no chairs and tables, no high-tech electronic devises included. On her very first day on the job, she arrived at her Camp Long Tiny Trees site with her forest classroom waiting to be assembled, never having taught Seattle Preschool Program’s HighScope Curriculum, and with a band of fourteen eager three to five year olds ready to go. It’s been a creative process of experiential “hands on-minds on” learning as you go from day one. The morning of my visit was one of those delightful Seattle days of high overcast, no sun but neither any rain; the kind of sky many Seattleites refer to as a beautiful day for the lack of moisture. The students were happily climbing trees, adding to their rock collections, examining similarities and differences between slugs and worms. However, every day certainly wasn’t like this during the 2016-17 rainiest winter season on record with its consecutive days and weeks of rain on end. Like many, I was curious to know how the seemingly endless rain and overcast effected student learning and teacher morale. The question seemed hardly to phase Katherine. She explained how the children naturally adapted their play from examining leaves and insects to exploring puddles, creeks, bogs, the many different ways to make mud houses, cakes and pies or use fallen trees for boats. The biggest challenge was far from consoling her students but rather how to integrate the academic components of the High Scope curriculum into the children’s day. Katherine quickly learned that sitting still would not be a viable option; her teaching strategies would need to involve learning while in motion in order to stay warm through Seattle’s rainy season. Hand warmers, hot tea and cocoa were as much a part of her required materials list as paints and crayons. Indeed, these traditional preschool materials quickly became obsolete in the rain. Katherine found herself constantly innovating with use of natural materials that stand up much better than soggy paper in the incessant moisture. Leaves were far easier and more fun to cut into interesting shapes than paper. Fallen limbs, boughs and twigs could be arranged in letters to form words, numbers, and even sentences. Basic addition and subtraction could be taught by arranging rocks and pebbles into simple equations and formations. As Katherine pushed her envelope of creativity with the use of found materials, so too did her students expand theirs. In fact, while the Camp Long Tiny Trees preschool site includes a forest classroom tucked into a small grove of trees with rooms designated for the “library,” “Discovery Zone,” “Art Room,” etc. it was when the students were out of the organized classroom, walking the trails, exploring the nooks and crannies of the forest that their creativity truly came alive. I got to witness this first hand as I watched students encounter and problem solve around their own challenges from inching up, and importantly inching down tree trunks, helping one another across streams, discovering a dozen ways to jet propel water out of puddles, the variations of the many different ways snails emerge from their shells, identifying which rocks had the brightest crystals and warranted adding to their growing Tiny Trees treasure chests. All of these encounters involved some level of risk; the risk of truly getting your feet wet, of getting stuck in a tree, of stumbling over a root which happened as frequently as the students got up and carried on. All of these daily encounters continued to expand students’ creativity, cooperative spirit, and as a result, personal and group resilience over the course of their preschool year. At Tiny Trees, students and teachers alike learn by doing, create and innovate in moment to moment, real life experiences all day long. The natural environment, its infinite opportunities for learning, and diversity of materials, serve as students’ greatest classroom and teacher. Katherine’s job, which she handled masterfully, was to watch, facilitate and encourage, but not to dictate learning. Rather, Tiny Trees students are learning through virtually every step on the trail, every splash in a puddle, every ascent of a new rock or tree. Throughout the school’s entirely outdoor year, students blossomed in their capacities in cooperation, creativity, and importantly in their caring for the earth and one another. Katherine worries about how some of her graduates will adapt to indoor kindergartens in the upcoming year. She is however certain that many will carry their newfound creativity and caring for their earth and their Tiny Trees companions over their lifetimes. Susan Carlson is a proud graduate of an outdoor preschool! She moved to Seattle in 2014 from Washington, DC where she worked for The Wilderness Society, National Audubon Society, US Fish and Wildlife Service and as Director of EnvironMentors, an environmental science college advancement for diverse youth now located at fourteen universities nationwide and has raised over $2.5 million for environmental education initiatives. Susan is currently leading an effort to develop an Environmental Learning Center at Saint Edward State Park, on the boards of E3 Washington, (formally WA Asst or Environmental Education) and NatureBridge, the Advisory Board of Mountains to Sound Greenway Trust. She often wonders to what extent the opportunities to spend so much of her early learning years immersed in nature had on her passion to ensure that all children, everywhere have similar opportunities to grow up in, learn, play and serve in healthy environments.